Applebee's is offering a free meal, from a select menu, to Veterans and Active Duty Military on Veteran’s Day. Provide proof of service required. All current and former military personnel will also receive a $5 coupon that can be redeemed between November 12 and November 27, 2016. 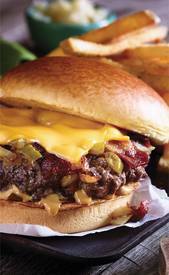 One of the options is the American Standard All-In Burger, with Bacon, pickles & onion seared into the burger! Yes, please! !